ScaleUp Lab by FATE Foundation is a unique Accelerator Programme aimed at providing targeted support to early-stage high-potential and growth-driven ventures within the growth sectors of the Nigerian economy namely; Agribusiness, Creatives, Health and Education. 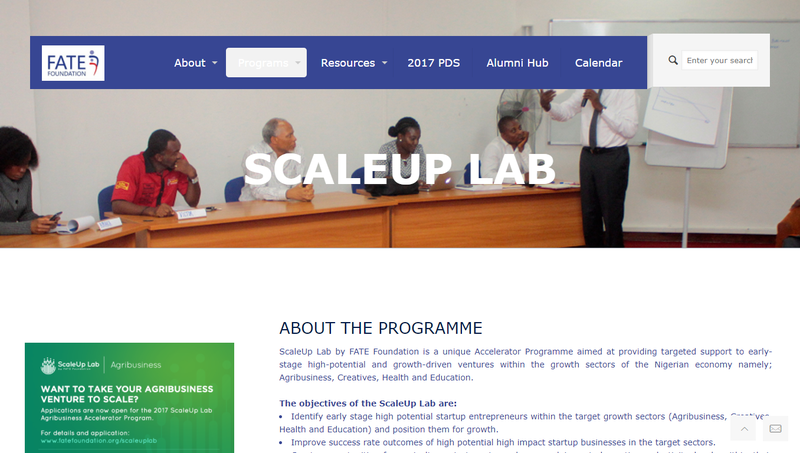 Available to participate full-time in the one-week bootcamp between (Monday, August 7, 2017 - Friday, August 11, 2017) and all other activities required throughout the duration of the programme. Application opens on Wednesday, June 21, 2017 and closes on Sunday, July16, 2017. Applications submitted after the deadline will not be accepted. Completed applications will be evaluated by the Agribusiness Accelerator Programme Review Committee. Only shortlisted applicants will be contacted.Successful applicants in the first round will be invited for interview after which 10 entrepreneurs will be selected to participate in the programme. Start of Programme: The Agribusiness Accelerator Programme will commence in July 2017 with an orientation session and a one-week accelerator bootcamp in Lagos. This will be followed by a one-to-one GAP Analysis to help each entrepreneur develop an individual growth plan and tailored roadmap that addresses the needs of the business. Programme Sessions: There will be about 6 meetups every two weeks for capacity building through peer learning and feedback, workshop and coaching sessions, one-to-one mentoring and a follow-up on each company’s progress. Entrepreneurs will have opportunities to meet and interact with several entities including partners, mentors, investors, and experienced entrepreneurs. Finally, a demo-day will be held after the meetups for business showcase and pitching to potential funding partners. End of Programme: The programme will close out with presentation of certificates at the FATE Annual Celebration in December 2017.